More people take beach holidays than any other type of break, and it’s easy to see why. They’re perfect for all types of holiday-maker, whether you’re a family, a back-packer or travelling as a couple. Cheap beach holidays can be pretty varied too, from the quiet and secluded white sands shared with a few seagulls, to an action-packed sandy playground with plenty of aquatic activities. In most cases, the beach is free to enjoy too, great if you have young ones who need to be entertained. If you’re after a cheap beach holiday, you’ll be best off avoiding hotels with highly-exclusive private beaches. In many cases, they can charge a premium for not having to share the sands with the general public. There are usually plenty of more reasonable accommodation options that are close enough to the beach to be convenient. One thing worth considering is if you are going to spend most of your holiday time on the beach, it can be cheaper to go down the self-catering route. Families on the lookout for something safe, with some on-beach entertainment, might be best looking close to home first. Across in Europe, Spain has 400 beaches to choose from, with plenty of reasonable accommodation nearby. Majorca, Malaga and Marbella are popular, as is the all-year-round sunny favourite Tenerife. The Algarve has plenty of choice, as has Greece. The Greek Islands have the perfect combination of safe bathing, reasonable accommodation options and good, simple food. Crete has very fine beaches like Balos Lagoon on the west side of the island, with its long, white sands and warm shallow waters. Other options are Myrtos Beach on Kefalonia, and the beaches of Corfu too. Croatia, with 2000 miles of coastline and thousands of islands, is a new favourite too as a beach destination, and offers excellent value. If you want to go clubbing after you’ve done your sun worshipping, the obvious favourite is Ibiza, the third largest of the Balearic Islands. The liveliest of the beaches is San Antonio, with plenty of great bars in the town too. June to September is the prime season, when clubbers stream to places like Space, Ibiza’s number one club. 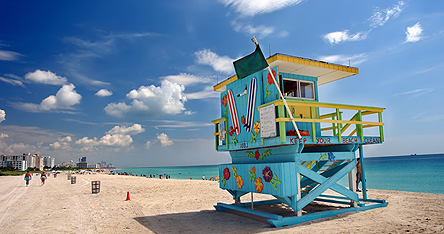 Across the Atlantic, you can have a cheap beach holiday in Miami’s party-crazy South Beach (SoBe, to the locals) if you are careful with your choice of accommodation. Try the Continental South Beach hotel, or the Day’s Inn if you want to go gentle on your budget. Couples will warm to the romantic island of Mauritius. Whilst not the cheapest of beach destinations, the beach holidays here are full of variety. The best bet for value is to choose one of the quieter, yet-to-be-developed areas like Ile aux Cerfs, an island off the Mauritian coast. Other longer haul-options where you can combine good value with a slice of tropical paradise are Cuba, the Dominican Republic and Jamaica. Whether you find your cheap beach holiday close to home or further across the globe, don’t book anything until you have checked the latest offers from Netflights.com.